Today’s menu: Lemon Blueberry Bundt Cake + a cup of strongly brewed tea (or coffee) and a good book to read. Also, have you tried these super delicious Blueberry Cupcakes with Lemon Cream Cheese Frosting? You must! This Lemon Blueberry Bundt Cake is summer in dessert form. It’s tender and moist, with a bit of tang from the lemon juice and buttermilk, and sweet with juicy blueberries. And don’t forget the cream cheese icing, which adds the perfect amount of sweet indulgence to the cake. Drizzle this beautiful bundt cake with the cream cheese icing (which is optional, but not really) and then decorate it with fresh blueberries and lemon slices. And you’ve got the prettiest of all cakes right there in front of you. 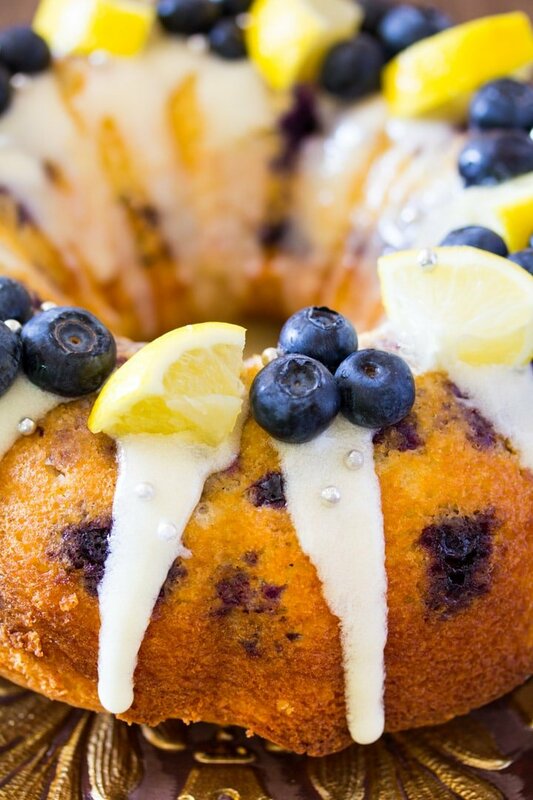 But don’t worry this Lemon and Blueberry Cake’s beauty isn’t just skin deep, it tastes just as gorgeous as it looks. AND it’s also as easy as bundt cakes get. Yay! 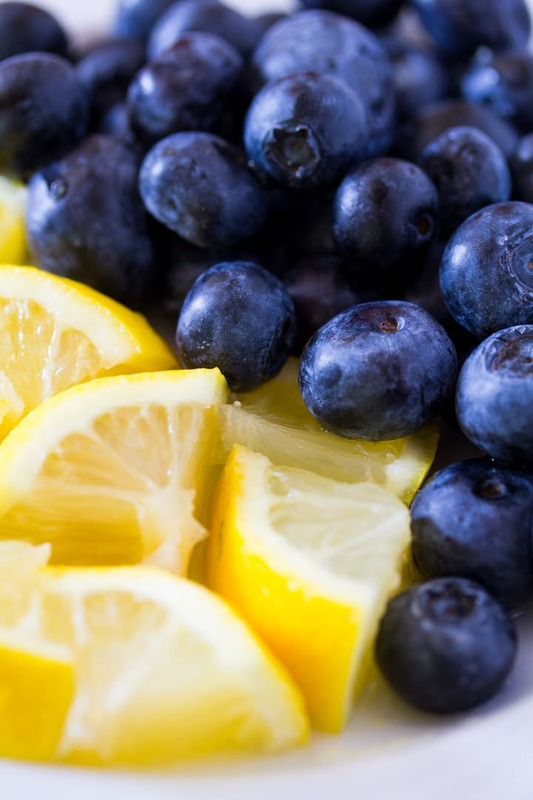 How Beautiful is this Lemon and Blueberry picture btw? So here’s the deal, we’re using cake mix in this recipe, but don’t worry it doesn’t taste anything like cake mix. Because we’re jazzing it up with buttermilk and yogurt (here we come moist land – okay sounds weird) and lemon juice. I used a white cake mix, but a lemon cake mix would be just as great (although then don’t add the extra lemon juice) or even a yellow cake mix would work. We start with a white cake mix…but don’t you worry, we’ll be jazzing it up so that it doesn’t taste like it came from a box!!! We amp up the flavor of this easy blueberry lemon cake with by adding buttermilk, yogurt and lemon juice to the cake mix. Also, in go three eggs. BTW this is VERY important: you ONLY need to use the ingredients listed in the recipe card below (do not add the ingredients listed on the back of the cake mix box). Then fold in the juicy blueberries (oh summer, how I love you) and pour the lemon blueberry cake batter into a bundt cake and bake. 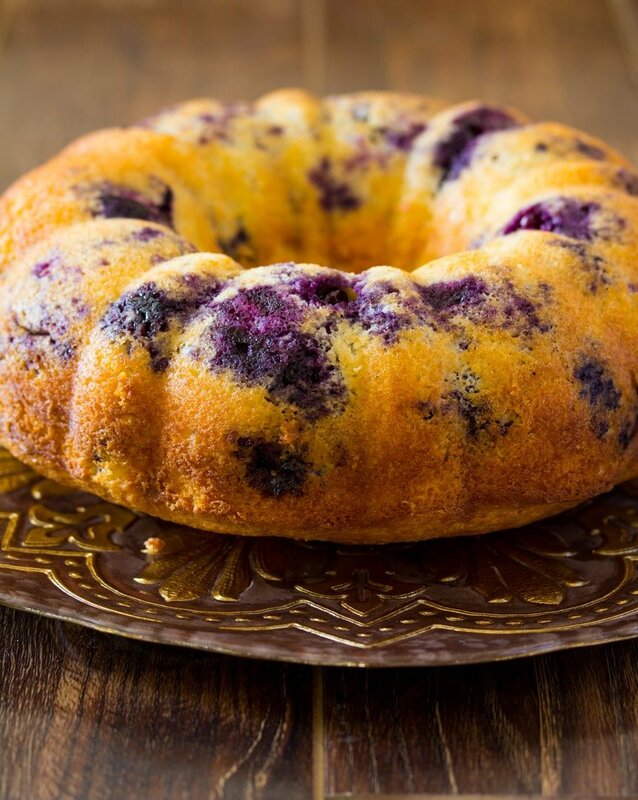 Can I Use Frozen Blueberries for this Lemon Blueberry Bundt Cake? Yes, you can use either fresh or frozen blueberries. No need to thaw the blueberries. 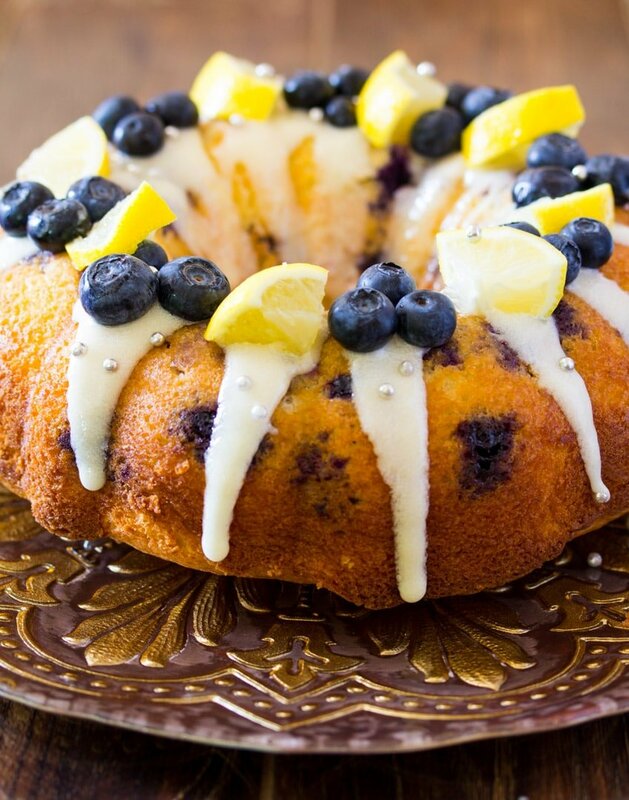 What Kind of Lemon Juice Should I use for this Easy Blueberry Lemon Cake? Please use fresh lemon juice for this cake. Store bought juice tastes nothing like the real thing!! Looking for more delicious summery desserts? 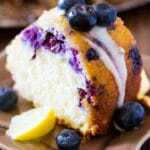 This Lemon Blueberry Cake with Cream Cheese Icing is soft and moist. 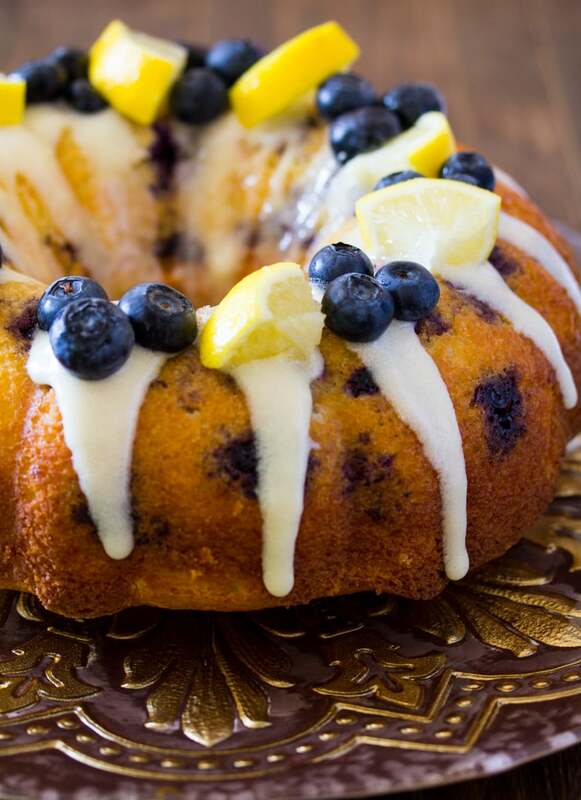 Every bite of this lemon blueberry cake is bursting with juicy blueberries and lemon. Preheat oven to 350 F (176 C) and prepare a 12 cup bundt pan by spraying it with oil and dusting it with flour. In another bowl combine the eggs, oil, yogurt, buttermilk and lemon juice. Using a hand mixer beat until fully incorporated. Transfer cake batter to the bundt pan, and bake for about 40-45 minutes or until a toothpick inserted comes out clean. Remove the cake and run a sharp knife around all the edges of the bundt pan. Let the cake cool for 15-20 minutes until removing from the bundt pan. While the cake is cooling, prepare the cream cheese icing. Place cream cheese and butter in a mixing bowl and beat with an electric mixer until light and fluffy. Add the powdered sugar and lemon juice, and beat for 2-3 minutes, until the icing is light and fluffy. 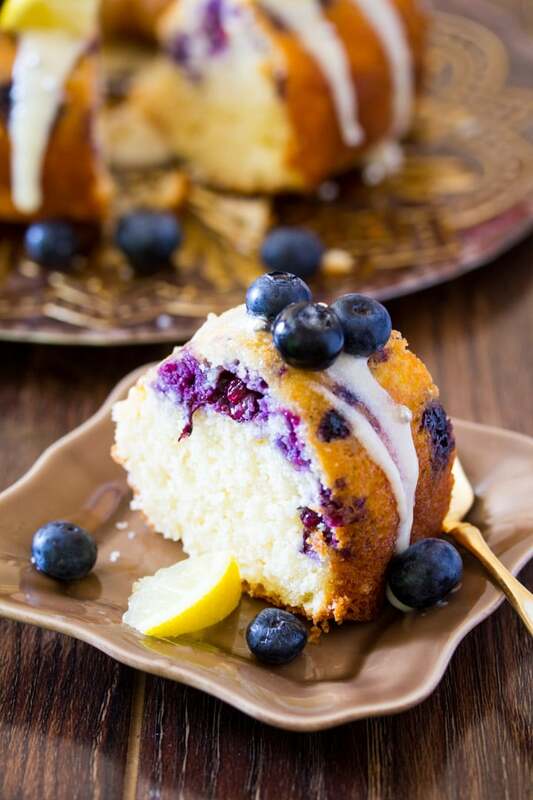 Drizzle cake with cream cheese icing, and decorate with fresh blueberries and lemon slices. 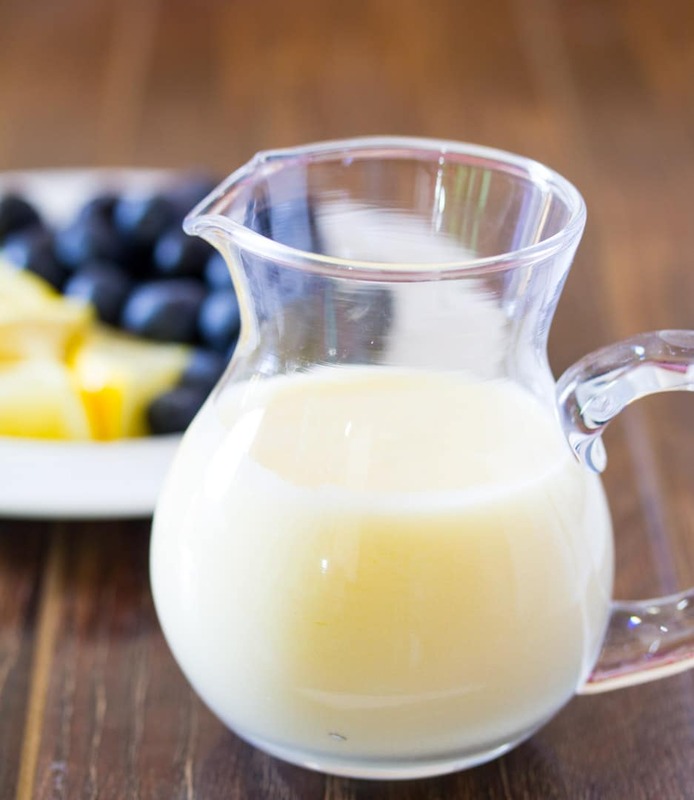 Homemade Buttermilk: Add 1/2 tablespoon of white vinegar to 1/2 cup of milk and mix. Let stand for a few minutes, until the milk has curdled in appearance. Your homemade buttermilk is ready to use. I love blueberry cake and yours looks delicious, Wajeeha! I really love blueberry cake. And you have made it with cream cheese icing, it’s really going to be awesome in taste.You have really done a nice job. As you have shared the best things for me. What is cake mix? Is it cake flour? Thank you. Hi Adeline! Cake mix is the kind that you get in a box in the grocery store for example Betty Crocker or Duncan Hines make cake mixes. Cake flour is completely different and cannot be used in this recipe. Hope this helps. Hi, these look so yummy and I plan on making them tonight!! Just wondering how many servings this recipe makes?? Thanks!